Todd Astle joins Canterbury while Jimmy Neesham misses out for Wellington. 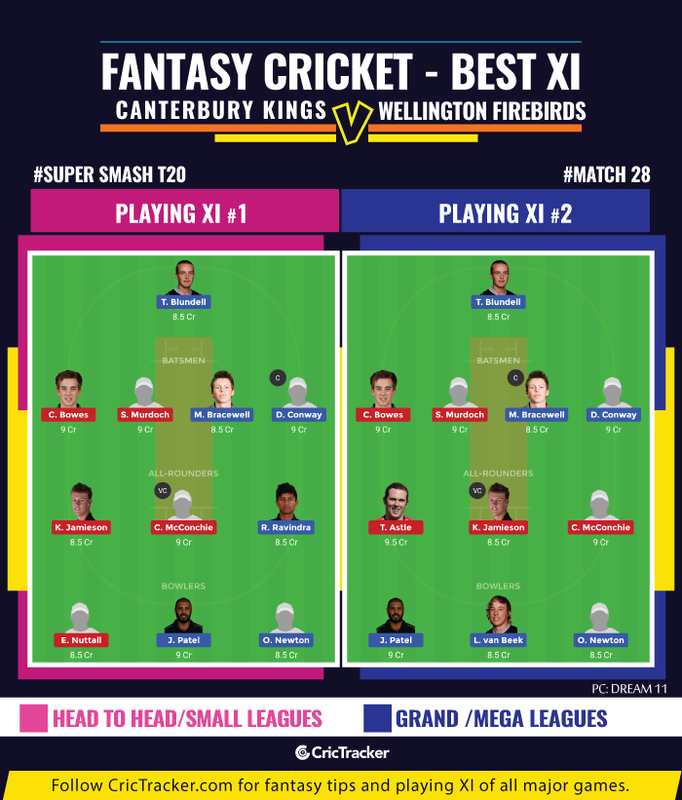 Canterbury Kings will face the Wellington Firebirds in the last game of the tournament for both sides as they failed to make into the final three. The Canterbury team were on a six-match losing streak before they defeated the Otago Volts by 30 runs in their previous game. Thus, they spoiled the hope of the Otago team of sneaking into the final three. On the other hand, Wellington Firebirds aren’t any better having won only three games this season. They are currently placed at No.4 and a defeat here could push them to No.5 if the Otago Volts win their last game against the Northern Knights. Canterbury also needs to win this game to have a chance of not ending the tournament at the bottom of the table. The 28th match of the Super Smash T20 2018-19 will be played between Canterbury Knights and Wellington Firebirds at the Hagley Oval in Christchurch. The match starts at 4:00 PM local time (3:00 AM GMT) (8:30 AM IST). None of the three matches to be played on Saturday will be broadcasted. The Hagley Oval in Christchurch is quite an unpredictability in the T20 format. High scoring games are usually recorded here and scores under 120 in some other games. The chasing teams have come close or chase down targets over 190 and at the same time crumbled to huge defeats. Record of chasing teams: Won – 3, Lost – 4. Steve Murdoch, Chad Bowes, Cole Mcconchie (C), Cameron Fletcher, Andrew Ellis, Kyle Jamieson, Jeremy Benton, Edward Nuttall, Todd Astle, Will Williams, Henry Shipley. Michael Bracewell, Devon Conway, Rachin Ravindra, Luke Woodcock, Lauchie Johns, Tom Blundell, Logan van Beek, Ollie Newton, Jeetan Patel, Ben Sears, Hamish Bennett (C). Jimmy Neesham has been added to the New Zealand T20I squad while Todd Astle returns for the Canterbury Knights. Jeetan Patel has been good in patches in this Super Smash. He is coming on the back of a couple of good matches as his bowling figures in the last two matches read 2/26 and 2/29. He will be a crucial pick in the game against Canterbury. Alternatives – Andrew Ellis, Rachin Ravindra, Steve Murdoch. The all-rounders section contains Cole Mcconchie, Kyle Jamieson, Todd Astle, Jeetan Patel and Andrew Ellis. Given the recent form, Jamieson, Mcconchie and Ravindra are the best three. Astle can be tried while Ellis is out of form. Canterbury Kings will start as favourites against the Wellington Firebirds as the Kings are coming from a good win.